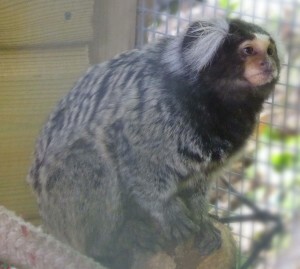 Following a public appeal, Wild Futures, the primate welfare and conservation charity, has rescued a marmoset monkey named Jerry from the UK primate pet trade and brought him to their sanctuary in Looe, Cornwall. Thanks to generous public support, Wild Futures raised over £2600 and were able to transport Jerry safely to The Monkey Sanctuary, pay for his initial veterinary check, and provide another temporary enclosure. Now he is at the Sanctuary, Wild Futures can give him the specialist care and attention to he needs to live a full and interesting life. Last week, Jerry stepped outside for the first time in two years and felt the warm sun on his pale skin. Jerry’s exact age is unknown as his history is unclear, it’s believed that he is around 3 or 4 years old and has been kept as a pet in at least two different homes. He lived in a small cage for two years, with no access to an outdoor space. It is likely that Jerry was taken from his mother at just weeks old and tragically, for a highly social monkey, he has been kept in a life of isolation for most of his life. In the wild, common marmosets live in extended family groups of 3-15 individuals; they will forage together and sleep together. At Wild Futures’ Monkey Sanctuary, Jerry now has the chance to be a monkey again, he will live in specially designed enclosures and afforded expert care.